Built over two or more levels, Hi280 Multi-Tier Shelving provides optimum use of warehouse space by using the full height of the building for storage. Available to be constructed as the continuous frame or continuous floor method of build, multi-tier shelving is a much more economical option than building a separate mezzanine floor. 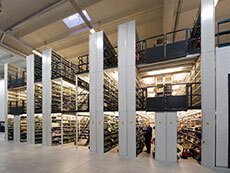 A strong and robust construct, it is a long-lasting storage solution. Due to lower construction costs in terms of manpower and time, Hi280 multi-tier shelving can often be a more economical choice than standard shelving across two floors with a separate mezzanine floor as the entire multi-tier system is built as one. Providing more storage space with less cost, the Hi280 multi-tier system can help to maximise warehouse or facility space more economically. As the overall loads concerned can be substantial, the installation of an Hi280 multi-tier system demands careful planning and consideration. In order to ensure the highest standard of safety, every design must be individually calculated. Stabilised bracing is used due to the required high load capabilities of the system (although this can depend on the height of the system). To find out more how you could benefit from a multi-tier installation you can download a brochure, or alternatively, call us now on 08082399422 to speak to one of our experienced sales advisors.